Many golfers say that The Love Course at Barefoot Resort is aptly named – as they love this Myrtle Beach golf course! Once you play this course, we think that you will fall in “Love” with it as well. Barefoot Resort Love Course was designed by a North Carolina Native, Davis Love III and he really makes the Lowcountry character a focus in this design with the ruins from an old plantation home that can be seen on holes 3 - 7. The Love course is the shortest of the 4 golf courses that make up Barefoot Resort and Golf coming in at just around 7000 yards from the back tees. Barefoot Resort Love Course features wide and open fairways that give way to generous landing areas for your shots into the greens. 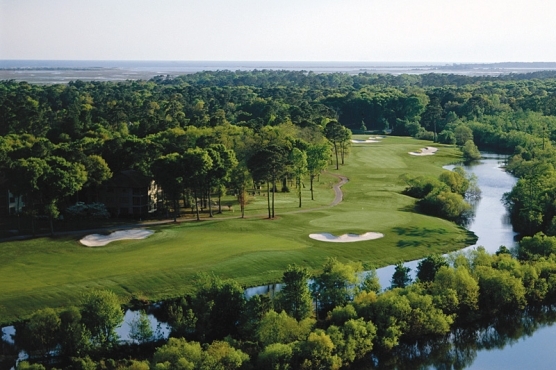 The Lowcountry design sets the stage for a memorable round of golf, suitable for golfers of all skill levels. Like the other 3 courses at Barefoot Resort, The Love Course features GN-1 hybrid turf for the tee boxes and fairways with Champion UltraDwarf Bermuda on the greens. Speaking of greens, many people have indicated that when playing this Myrtle Beach golf course, the landing areas and greens will remind you of the green complexes found at Pinehurst #2, which has been host to a few US Opens. When you play this par-72 golf course, it’s easy to see why so many golfers return to play it each time for their Myrtle Beach golf package. It was designed to be a fun and memorable round of golf for all playing levels. The Barefoot Resort Love Course was ranked as #1 back in 2005 in the Golf Digest “Top 50 Courses of Myrtle Beach” and is consistently ranked in the top 10 for the state of South Carolina golf courses to play. Like the other courses in the complex, the Love Golf Course can be a little expensive (by Myrtle Beach golf standards), so we suggest that you take advantage of one of our packages, or book on our sister website for 48 hour tee times. Of course, rates are highest in season and during the weekend. Try off season or early in the week for the best rates possible. Call us today and add Barefoot Resort – Love Golf Course to your list of must play courses during your next Myrtle Beach golf package.